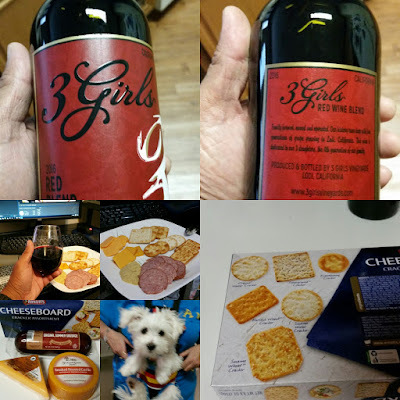 New wine for the Winos...3 Girls Red Wine Blend! Comes in at 13.5% alcohol content, too! Both Winos agreed to buy this one again. Has a slight sweetness but not too much to negate the Red Wine Wino's preference for "non-sweet" wines! Add a Cheese Board and a cute Maltese Puppy and everything is just right in the world! Katy Trails Plano for Margaritas and Sangria! Not Just Wine... Sodas Too!